Do you ever have a strong craving for something sweet, but you don’t want to blow your whole plan? I do and honestly pretty often. I have a huge sweet tooth and sometimes it is just too hard to tame it! The vanilla pudding tastes delicious even without the sugar and fat. I have eaten it by itself as well as with the banana and it hit the spot. So what you do is prepare the pudding as per the directions on the box, using whatever milk you have available to you. 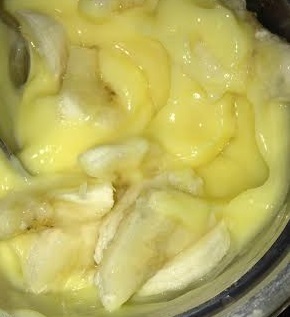 Then after it has set in the fridge, serve yourself a half cup (one serving), dice half of a banana, and mix it together. Sit down and enjoy the sweet and complimentary flavors! It’s a dessert, but at least half healthy! Made with 1% milk and half of a small banana, it totals around 115-125 calories for the whole treat! What a lovely low-calorie way to fill your sweet tooth’s cravings! Plus it has the added bonus of 4 grams of protein from the milk! You could also try other fat free, sugar free pudding flavors mixed with other fresh fruit or even canned fruit and find what works for you if this doesn’t sound good. There are so many options! Posted on October 5, 2015 October 5, 2015 by Bonnie McConaughyPosted in Bananas, Dessert, Food, Healthy, RecipeTagged Dessert, Food, Health, Healthy, Losing Weight, Weight Loss. I really like your food tip posts! They’re so helpful and such good ideas! I hope these make a more frequent appearance in the future, can’t wait to try these out!